Food can be a strong reminder of one’s own past such as Marcel Proust’s madeleine, but it can also go beyond the personal to evoke historic moments in time as well. An amusing British series The Supersizers Go featured restaurant critic, Giles Coren, and comedian, Sue Perkins, eating through time including the Middle Ages, The French Revolution, and Ancient Rome. The title is inspired by the documentary Super Size Me. You can sample some of Sue and Giles’ zany antics on Hulu. Watching them made me want to dip my own spoon in the culinary broth of history and find recipes from the past. These three books all available at the Hoboken Public Library will give you a taste of some sweet and savory flashbacks. 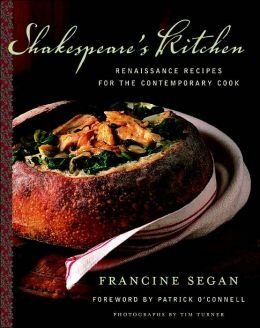 Shakespeare’s Kitchen by Francine Segan with color photographs by Tim Turner collects recipes from the Renaissance period. The recipes have been updated for the modern stove top and given in the standard recipe format that we are used to (during the Renaissance ingredient lists, cooking times, and exact measurements were not included). A nice inclusion though is that original recipes are also provided in most cases as well. Additionally, sprinkled throughout are quotes from Shakespeare and historical tidbits. It is interesting to see what ingredients are included and excluded. Prunes and dates are used heavily in savory dishes, but tomatoes are missing. Although several dishes have edible flowers and rosewater featured in them, chocolate and vanilla are not found in a single dessert since they were unknown at the time in Shakespeare’s London. I do not think the majority of the recipes will be making a heavy rotation in most people’s diet today unless they are a heavily committed SCA member, but I would still recommend this book for its interesting historical value and an option for a unique dinner party; the book puts together sample menus, invitations, and decorating ideas for this purpose. Segan has three other cook books available from BCCLS libraries The Philosopher’s Kitchen, Opera Lover’s Cookbook, and Dolci. 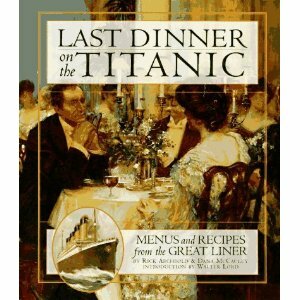 Last Dinner on the Titanic by Rick Archbold with recipes by Dana McCauley is richly illustrated and a treat for food lovers as well as those with an interest in history’s most famous ship. Several menus from the voyage survived (including two from the tragic evening of April 14, 1912) and dishes are recreated from ones that would have been used at the time in first, second, and third class. The book gives suggestions for everything you would need for throwing a Titanic themed dinner party including music likely to have been played on the ship, fashion suggestions, and even down to the proper way to fold the napkins. Beautiful illustrations and photographs of items and the interiors of the Titanic and her sister ship, the Olympic, are found throughout. Vivid descriptions on what it would have been like dining on the ship and short biographies of some of the passengers (amongst them Hoboken born silent film star and model Dorothy Gibson) that you may want to role play are also included. If you find having a dinner party recreating such a tragic moment in history lachrymose, you could instead use the book to create an Edwardian themed meal; the food is representative of the best of what was available at that time in the UK and America. Several other books Archbold has written or co-written are also available from BCCLS Libraries including two more books about the Titanic: The Discovery of the Titanic and Deep-Sea Explorer: The Story of Robert Ballard, Discoverer of the Titanic. 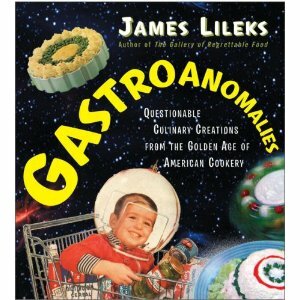 Gastroanomalies: Questionable Culinary Creations from the Golden Age of American Cookery by James Lieks takes a humorous look back at old ads, recipes, and photographs from the 1950’s, 1960’s, and 1970’s. I was slightly disappointed in the book. Although I found some of Lieks quips about the pictures and other materials funny, some of his humor seemed to me to be channeling his inner ten year old boy and a few I found a bit off putting and crude. I was also somewhat disappointed that there were not more recipes to go with some of the images of food. In some case the reader is left wondering what an item might truly be beyond the lump of food in the grainy photograph. Perhaps, though this is for the best, as someone who once served both a turducken and a piecaken for Thanksgiving, my family and friends may have been saved from some jiggly jello abomination that I found amusing. The book is less well researched than the other two books and I would recommend it more for people who enjoy humorous takes on life than foodies or history buffs. If you enjoy this work, James Lieks also has written The Gallery of Regrettable Food and Mommy Knows Worst which are available from BCCLS Libraries.